There are two ways to see a photo. The first is to see with our mind. This is a literal interpretation of what we see. It’s the lazy way we see, but it’s still important. For example, here is a film still of Bruce Lee and Kareem Abdul-Jabbar from Game of Death (note: for my presentation all the images I used were of my childhood hero Bruce Lee). Bruce Lee and Kareem Abdul-Jabbar in the film Game of Death. This is my mind analyzing the image. This way of seeing is important to understand the story and context. If I want to use this image as part of a design, say for editorial, I want to make sure its narrative supports the article’s and has a meaningful relationship. The second way of seeing is with the eye. Our eyes are similar to cameras that see the world less as content, or subject, and more like elements of a composition. When I see with my eyes I examine positive and negative space, color, lines, movement, light and dark, patterns, and shapes. I do this with everything I design, rather it be an app, a web page, or print layout. In this case I’m looking at an image to determine how I might further crop it to create more tension. An exaggerated example of how I might see the photo as positive and negative space, shapes, and light and dark tones. Below I annotated how I see lines and movement in the image. There is a lot of movement and direction, but my attention is drawn to the direction of a convergence, where two lines meet. In this case Bruce Lee’s legs and feet are creating a convergence targeted at Kareem’s head. My eyes follow that convergence and I anticipate the impact of the kick. Lines direct our eye and creates movement. When I see with my eyes I also pay attention to the horizon line. This image has one horizon line, but many horizontal lines at slight angles. This image has uneven horizontal lines that create tension. Horizontal lines at angles create tension and make the image feel dynamic. I don’t always want that. I wouldn’t want to do that with a photo of an ocean, for example, unless it’s an image of a surfer riding a sweet wave or a ship battling its way through a storm. But if it’s a serene, calm image I’ll typically want the horizon line to be straight. This applies to most landscape photos too. The other thing I pay attention to with my eyes is the rule of thirds. This divides the composition into nine sections like a tic-tac-toe board. The image seen with the rule of thirds grid. The idea is to put the center of interest, the focal point, or other points of interest, not in the center of the composition, but near one of the intersections. The rule of thirds is a guideline that helps move the image away from the center, which often makes the image feel static. The other reason is that studies have shown that people naturally look at the intersection points. So I use the rule of thirds as a guide to move the subject off-center, closer to the edge, and by doing so I create tension and energy. 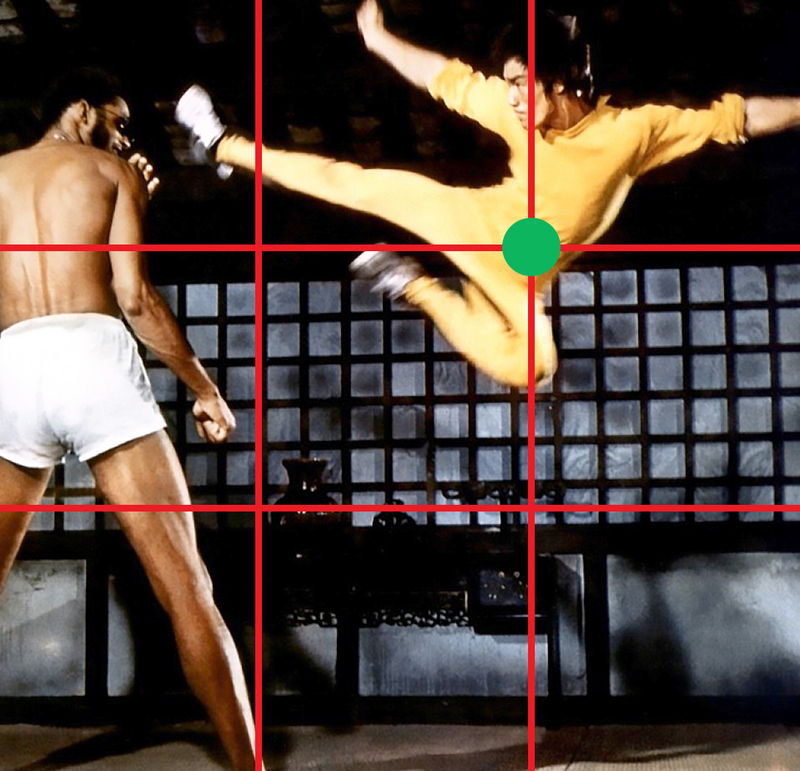 So using the rule of thirds to crop this image I position Bruce on the first X axis and second Y axis. I also rotate the horizon just a bit more to give it more tension. The result (below) is interesting and perhaps not as good as the original. But my purpose is to show you how to crop an image using the rule of thirds. The final cropped version of the image. However, my cropped version has more tension than the original and we feel closer to the action. It is less composed and removes many of the lines. It simplifies the composition and we’re less distracted by the fighter’s environment. There is less overall movement. The focus is now zeroed in on the main movement, the convergence. Fewer lines means more focussed movement and direction, and less distraction. It’s not that this is better than the original, but it has a different tone and energy. Choosing between the two depends on what I’m seeking — a composed image or a more intense one. Not every subject of a photo needs to be intense or positioned on the edge of the frame. The photo below feels correct centered because it’s stationary. The two actors are like statues. They’re posing for the photo, but it can still use some adjustments. First, it needs a hard crop to remove the top and bottom, which isn’t adding important information to the narrative or the composition. It’s just noise. The second issue is the photo’s horizontal and vertical lines are all at uneven angles causing tension and distortion. I don’t want that. So first, here’s the photo with the top and bottom crop. Photo with crops to the top and bottom. This is better, but now I want to address the odd angles in the photo, both horizontally and vertically. This is causing a slight distortion and tension. Because this is a calm, symmetrical image I don’t want tension. The photo will be better if the lines are straight. Here’s the result. An improved image all around. So remember to see images with both your mind and your eye. Your mind should analyze the photo for content, narrative, and relational context. Your eye should analyze the photo for composition and pay attention to line, shape, movement and contrast. The mind and eye then work together as the rule of thirds guides the amount of tension or calmness the image needs to harmonize with its narrative content.